Turn back time with volumising, youth-enhancing injections for a younger, more energised appearance. No one wants to look older than they need to, especially in today’s competitive workforce. Wrinkles, hollowed cheeks or tired eyes can feel like annoying guests we never invited. Signs of ageing make us look tired, worn out, not up for the challenge – right when we still need to operate in the fast lane. 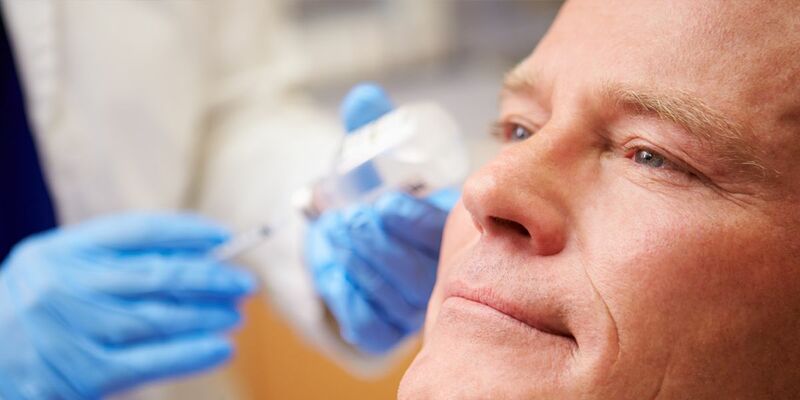 That’s why so many men are opting for the convenience and subtlety of cosmetic injectables. Quick, convenient and totally undetectable, injectables can take years away in just a few minutes. Also known as wrinkle relaxers, anti-wrinkle injections can be used in several areas around the face, but most commonly in the brow to relax frown lines and around the eyes to relax crows’ feet. Injections last anywhere from three to five months with top-ups required whenever the patient prefers. Highly effective, these wrinkle relaxers are also good to prevent deep wrinkle from forming. This treatment is often used in combination with dermal fillers. adding volume under the eyes to the tear trough area to minimise dark circles and hollows. Depending on the type of filler used (with thicker formulations usually lasting longer), fillers have been clinically proven to last anywhere between six months to two years. Injections around active areas of the face, such as the mouth and lips tend to dissipate more quickly; however, less active areas of the face, such as cheeks or temples tend to maintain the filler for longer.